Junk is always up for a challenge when it comes to replicating food from my childhood days. 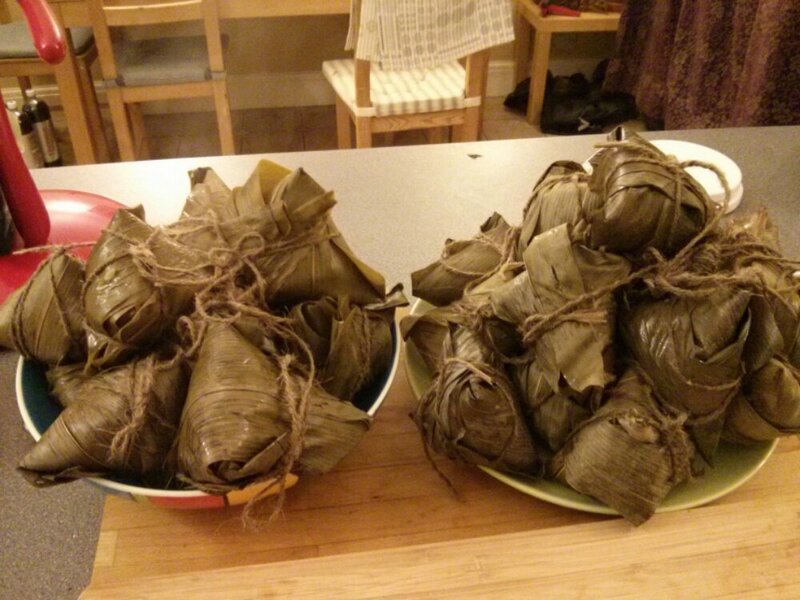 Previous endeavours include yam cake, radish cake, samosas, laksa and various other dishes my Mom would make. 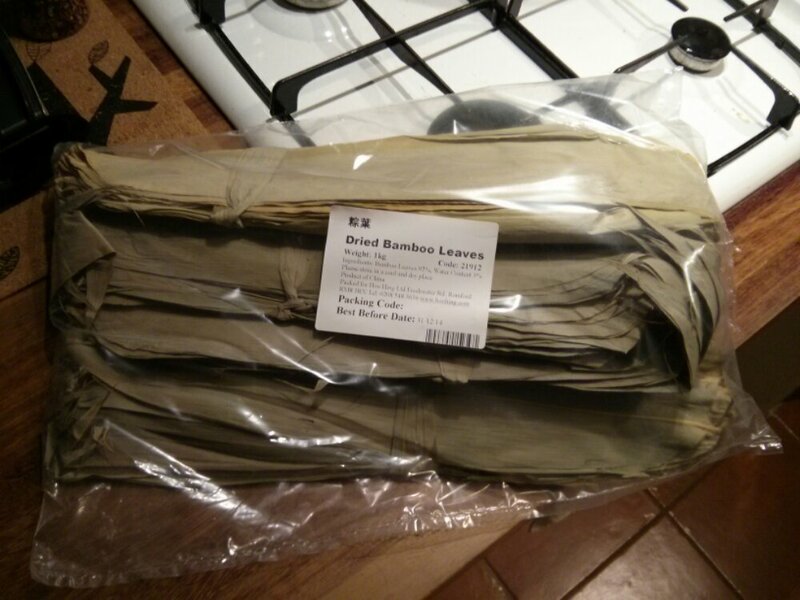 With time on my hands and a pair of spare hands from Boom, decided to up the ante and try something more daunting. 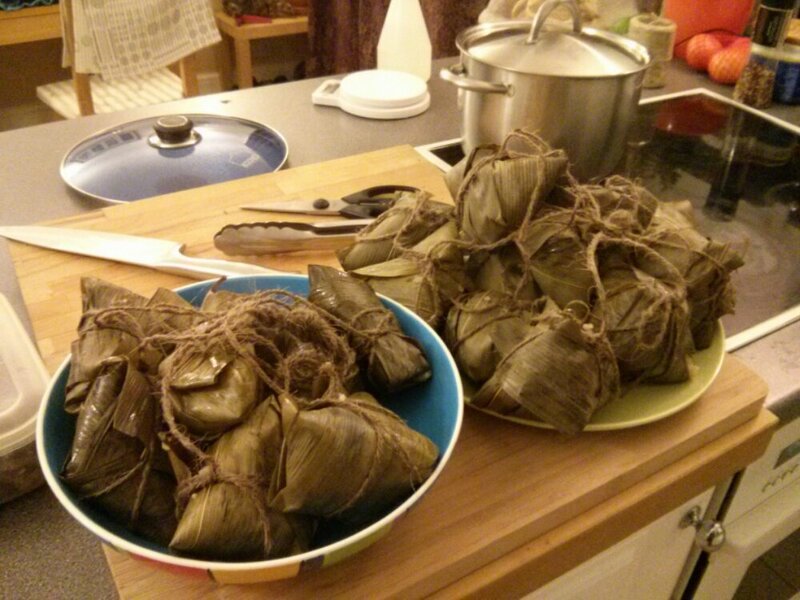 Bak chang or zongzi is a Chinese bamboo leaf wrapped snack made from glutinous rice stuffed with various ingredients. Depending on the stuffing, it can either be savoury or sweet. 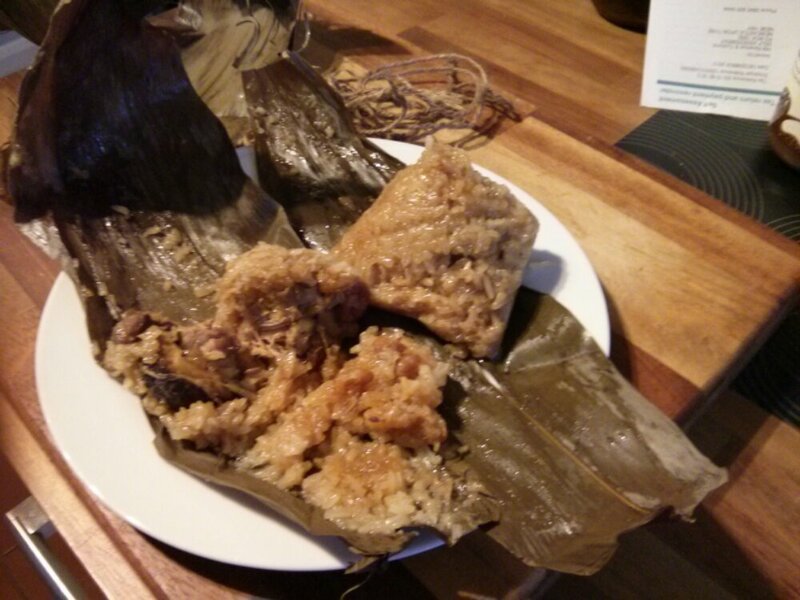 There is even a Nonya version which is a hybrid of the two with a slightly sweet minced pork stuffing. 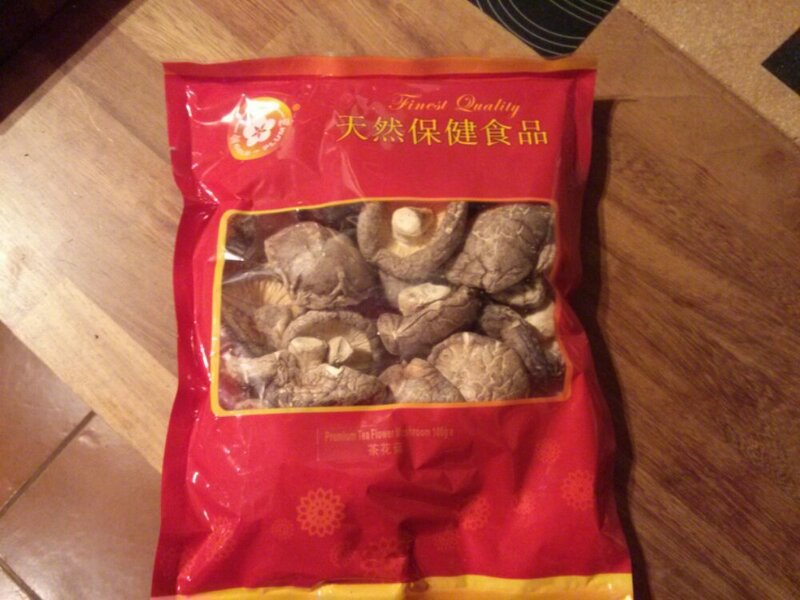 I went for the traditional version with pork, dried mushroom, chestnuts, dried shrimp and other bits and pieces with five spice seasoning. 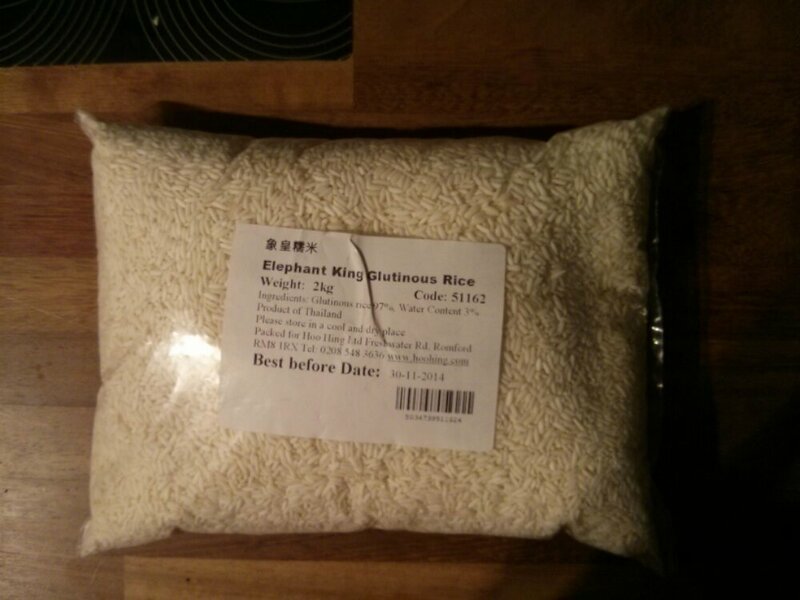 Won’t bore you with the ingredient list and detailed instructions. You can refer to other blogs for that. I know you are only interested in the pics! 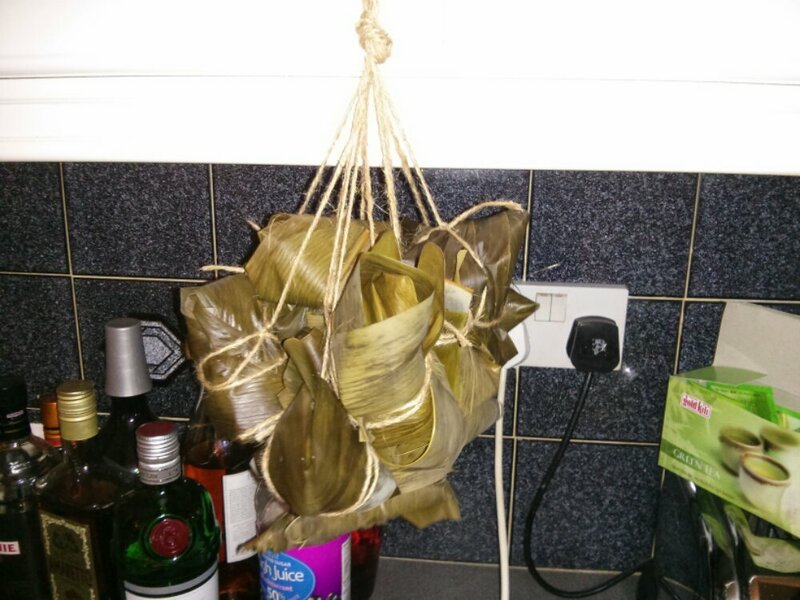 The wrapper – Bamboo leaves, in original packing and also after a soak. 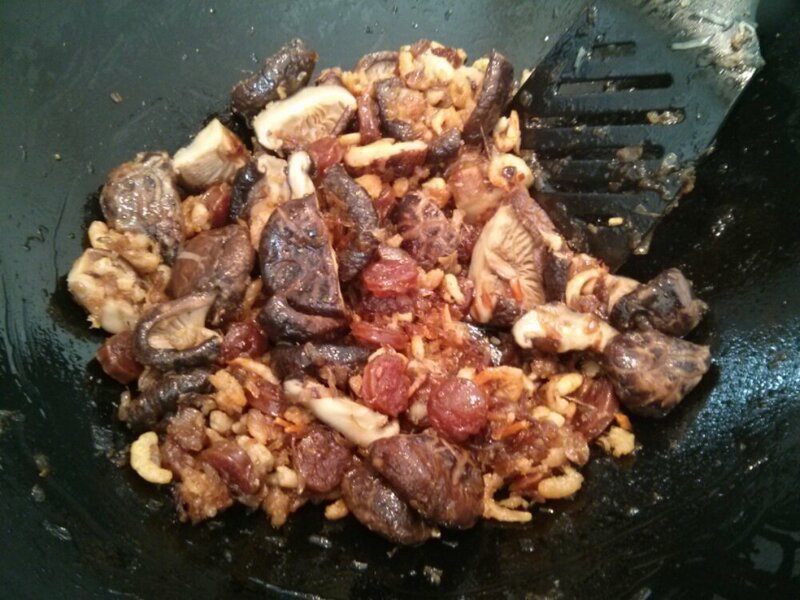 More stuffing – Dried Shrimp, Dried Mushroom and Chestnuts. 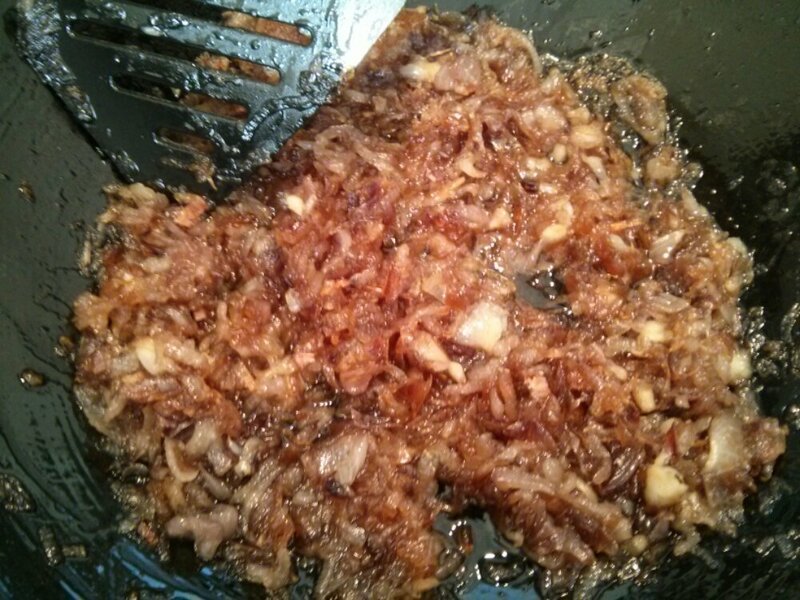 The dried stuff needs to soaked before frying. 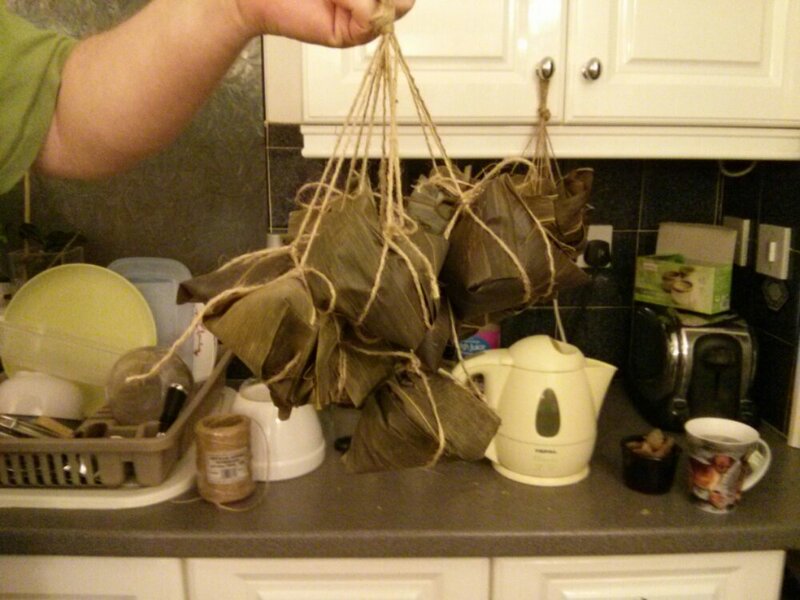 Boom’s bunch – Not bad an effort from the big clumsy cheese! 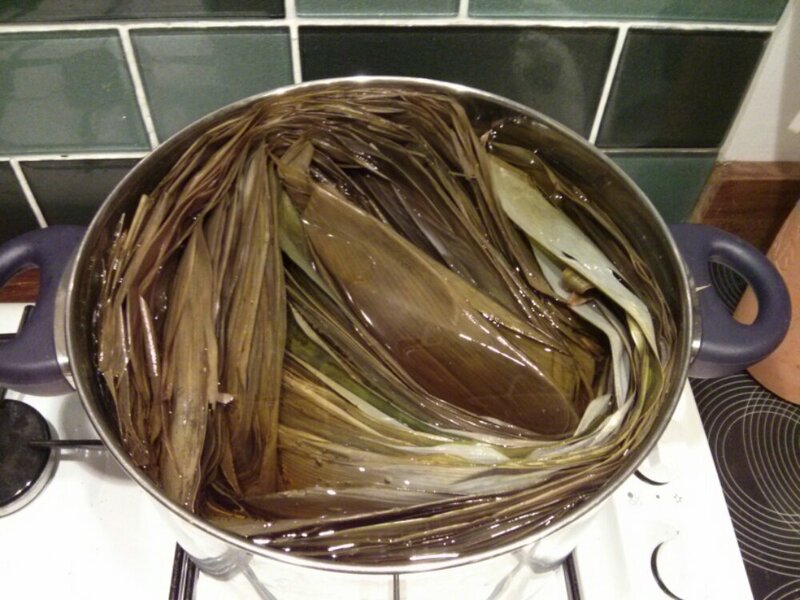 The horde – After slow boiling in water for 2.5 hours. What we had for dinner! 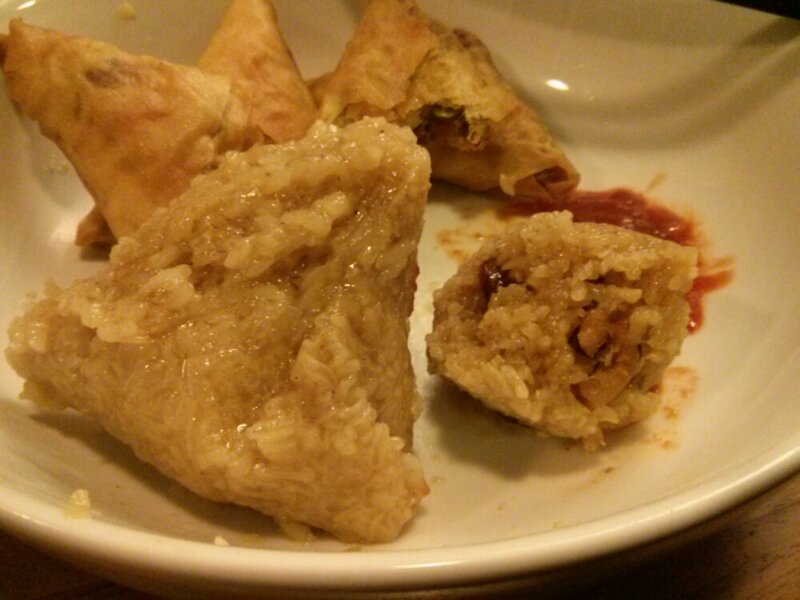 2 bak chang each and some homemade samosas. What I had for breakfast this morning. 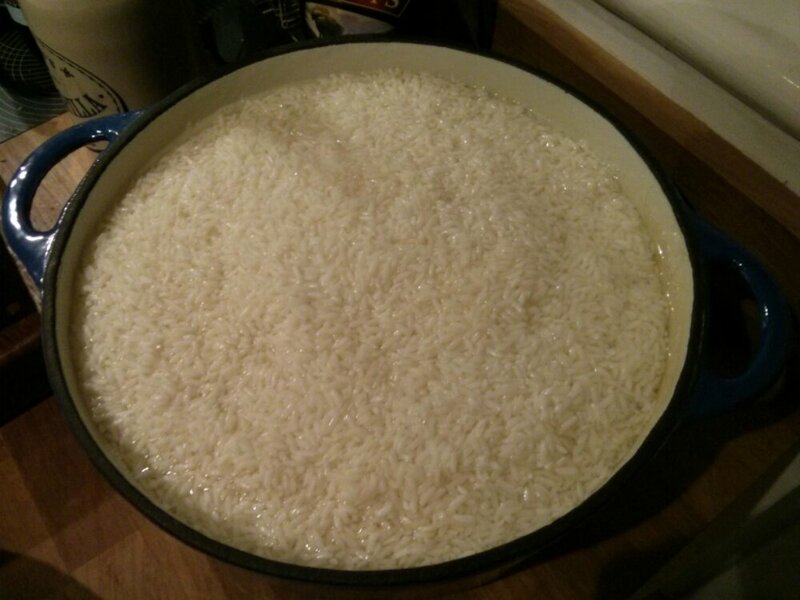 Reheat in microwave on medium for 2 minutes. 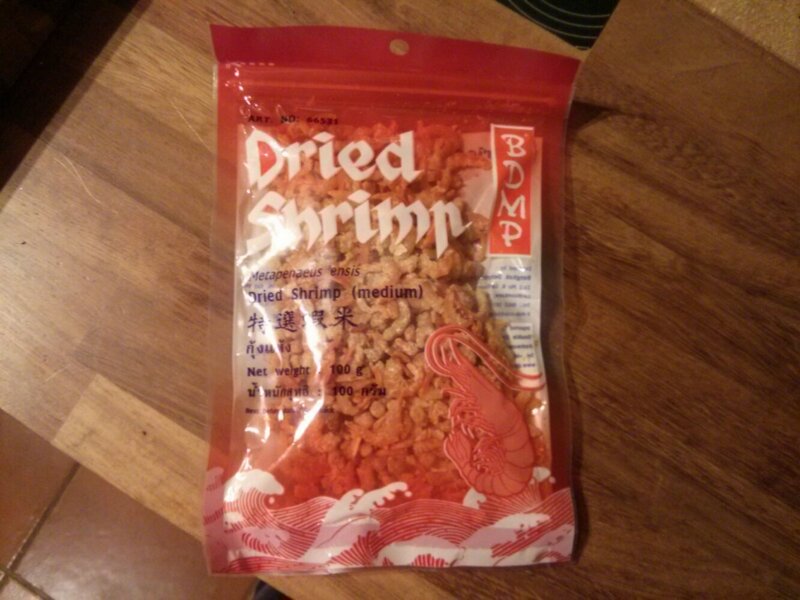 Best served with Lao Gan Ma’s Flavoured Chilli Oil or Maggi Garlic Chilli Sauce. I had a mixture of both! If anyone of you are interested and located in London, I have frozen the reminder of the horde and will be more than happy to share. Just drop me a comment! I know this looks like a big lunch but I had a partner in crime for lunch today. Though I could happily finish everything if I wanted to! 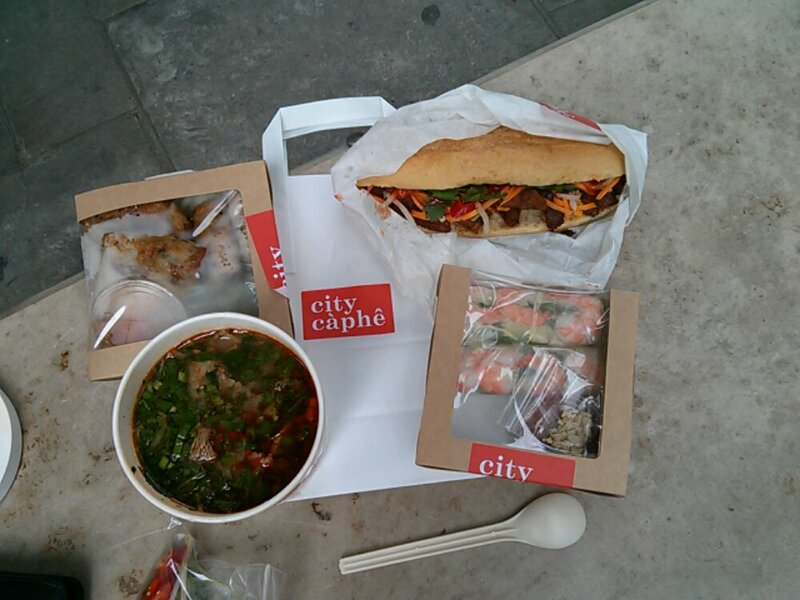 Was reading another food blog and there was a post about City Caphe which I realised is pretty close to where the Boom works while only a 15 mins walk across the bridge from me. When it comes to Asian food, Korean, Japanese, Chinese and Thai food are pretty well represented in the City but not Vietnamese. 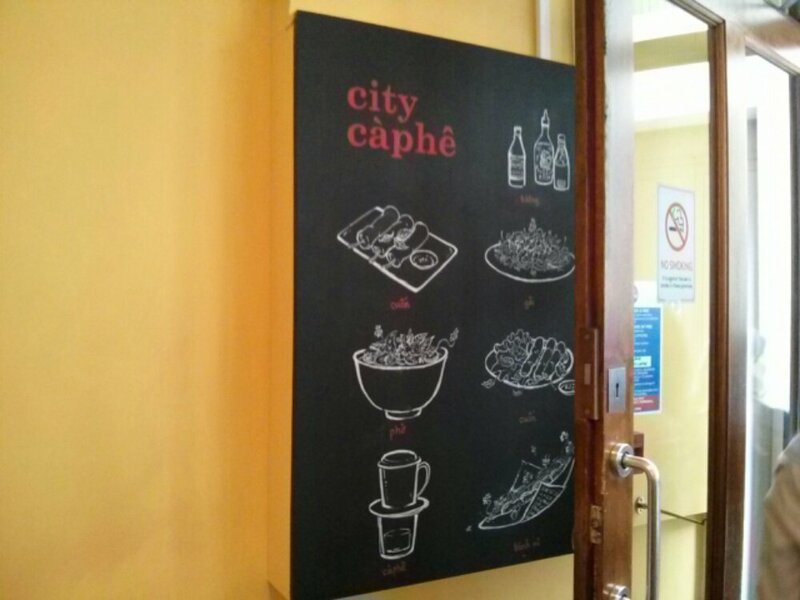 So City Caphe is a much needed find. When the Boom and I got to the place, the queue was about 15 deep but it moved pretty quickly and we both got our orders after 5 minutes. 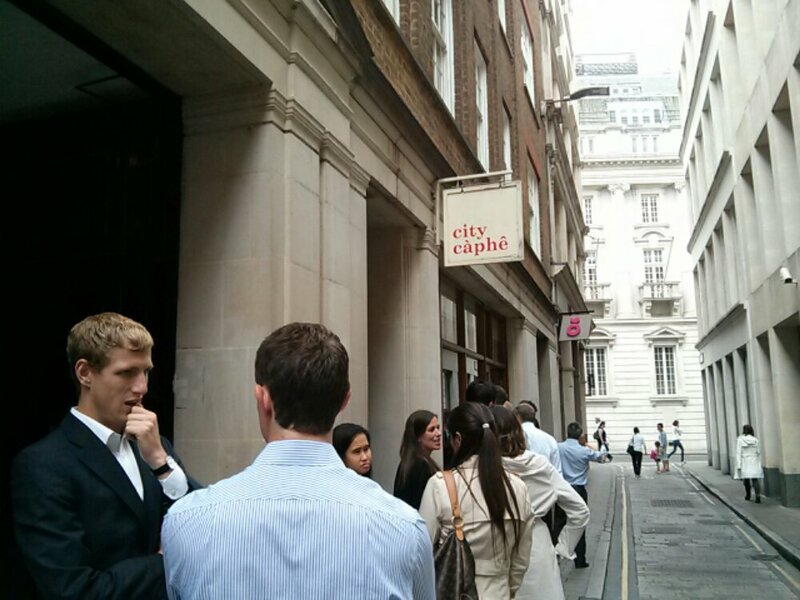 Not such a bad thing to be in the queue as it gives you time to decide what to order. 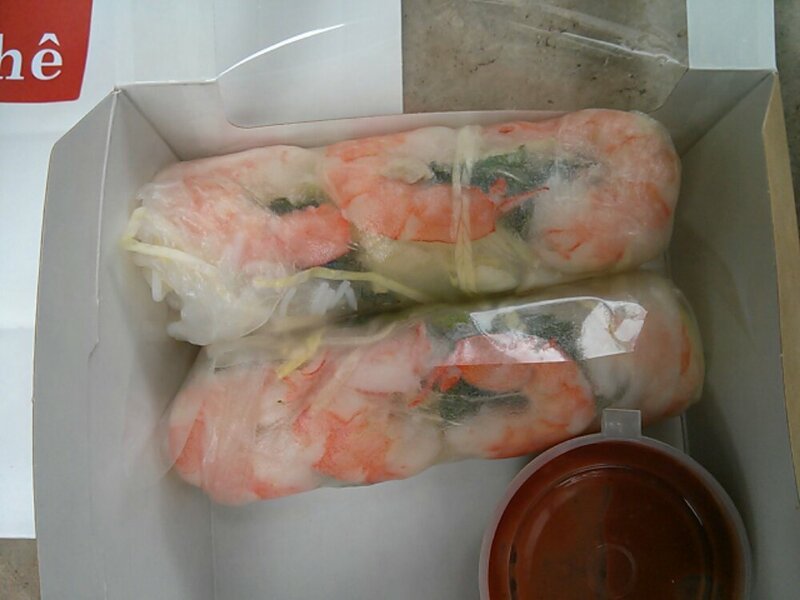 In general, the choices includes soupy noodles like pho or bun hue, vermicelli salad or rice with a choice of grilled meats, bahn mi filled with grill meat options and either fried spring rolls or summer rolls. The Boom went with a bahn mi with chargrilled pork (£3.50) and the fried spring rolls (£3.75) while I went for Beef Bun Hue (£6.50) and the summer roll (£3.75). 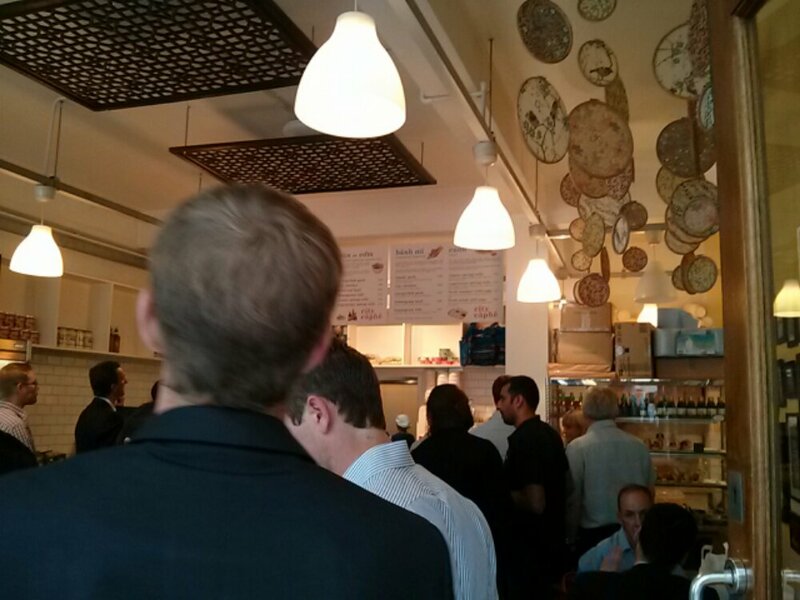 The problem with eating lunch in the city is finding a place to sit. 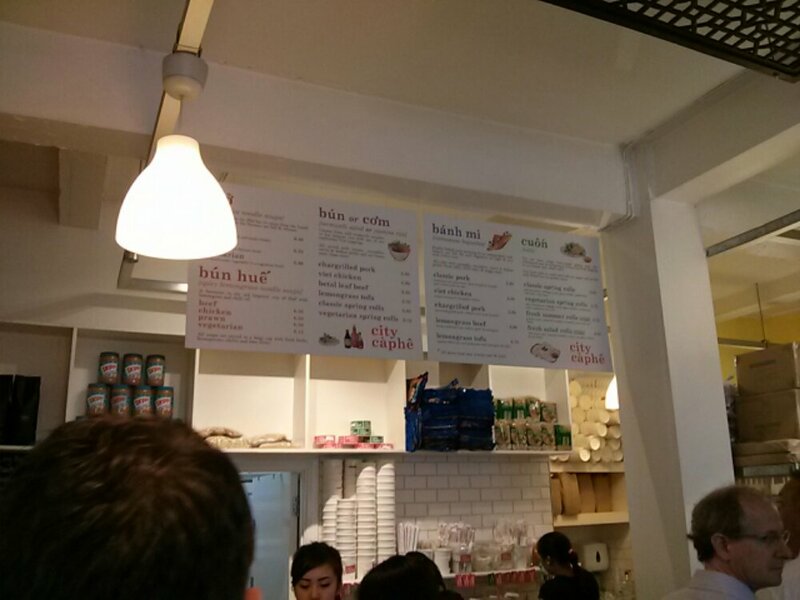 There are limited seats in City Caphe but as food were made to order, it was pretty stuffy in the shop. Most people bring their food back to the office but sometimes taking a break from the office setting relaxes the mind. 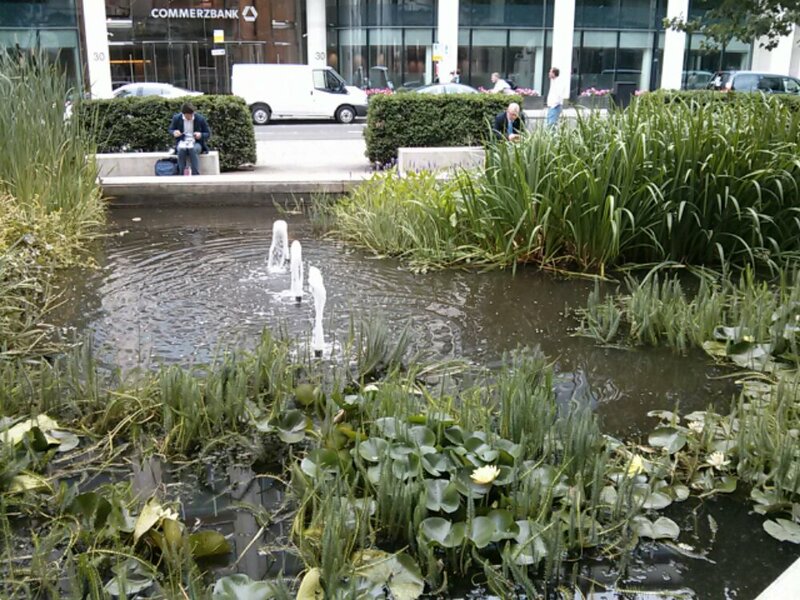 Thanks to the Boom who found this peaceful and tranquil setting near the Guildhall. 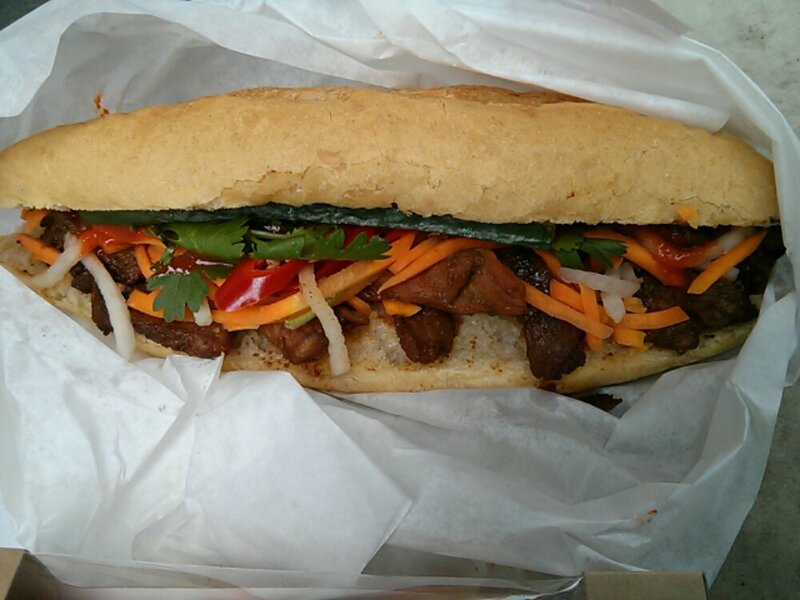 The Boom enjoyed his bahn mi. His one minor gripe is the bread could be lighter in texture. Get the lady to go easy on the sriracha as Boom was scorched by the sauce half way through his sandwich. We shared both the rolls and Boom preferred my summer roll while I have yet to have mine as my Bun Hue was very generous portion wise, especially the thinly sliced beef. 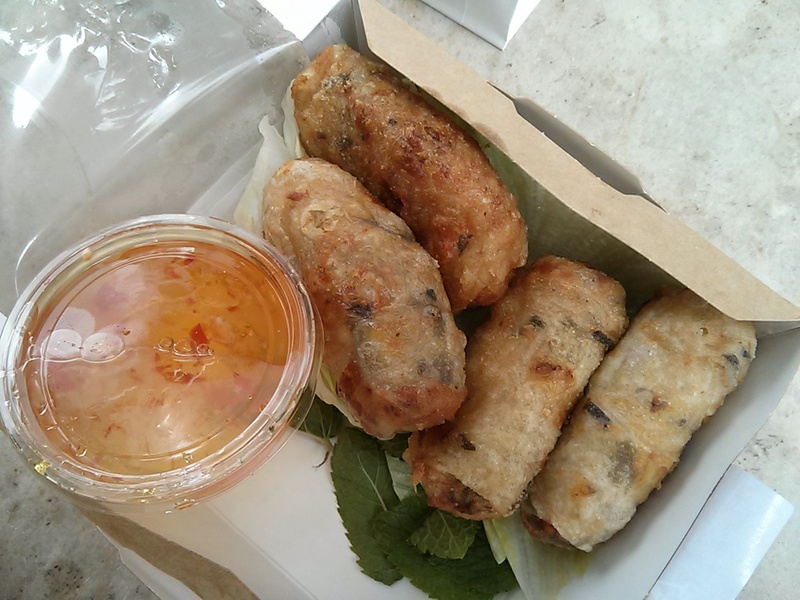 The fried spring rolls was served with a portion of nuoc cham while the summer roll was served with a different sauce. Once again, I’m always impressed when the herbs are provided in a separate container. 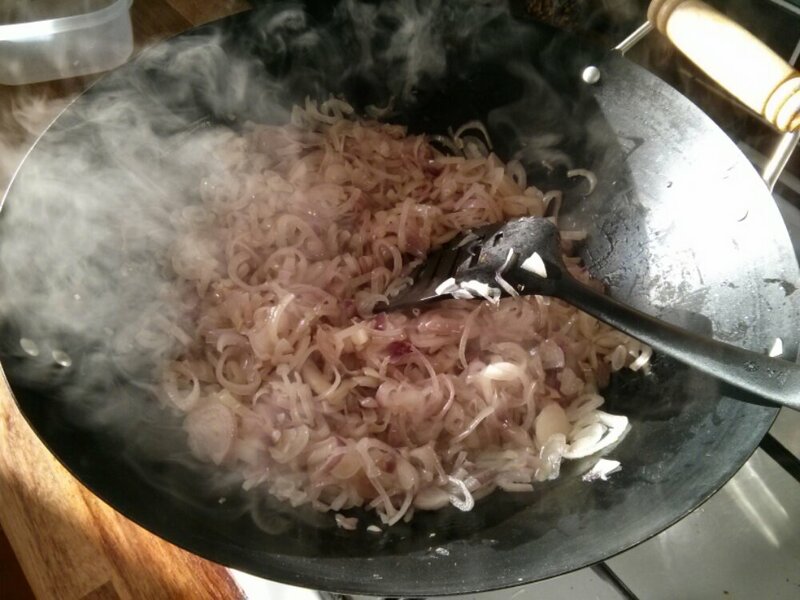 In this instance, there was sliced chilies, basil and some beansprouts. I would have loved more beansprouts. Word of caution, for those of you who can’t take the heat, suggest you go for the pho rather then the bun hue. Cute pictorial to link Vietnamese words to the food it represents. 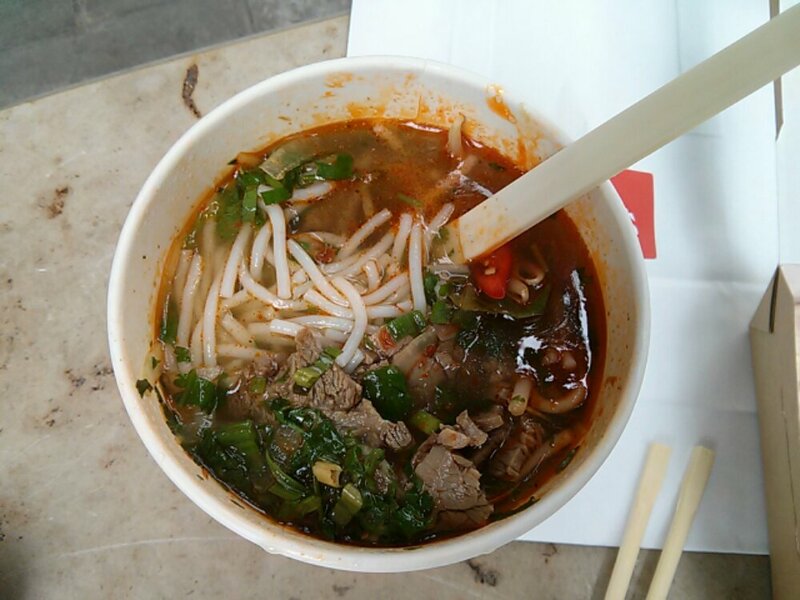 Will definitely go back to City Caphe when I’m craving for soupy noodles. Most people think that Borough Market only trades from Thursdays to Sundays and is dead early in the week. Strictly speaking, that is true as most of the stall selling fresh produce are closed. 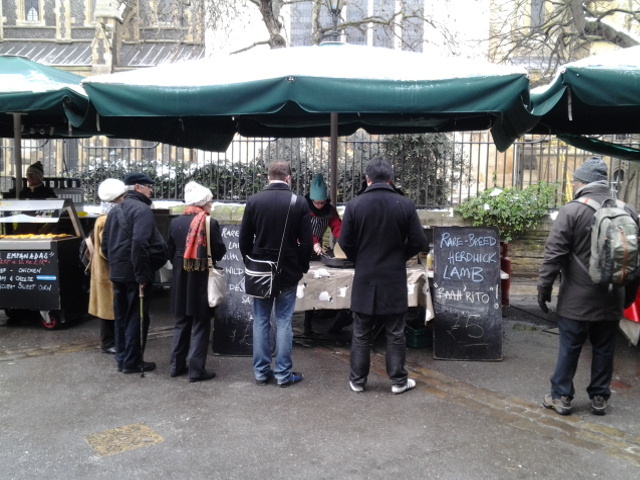 But there are a few stalls catering to lunch seekers open at the Green Market area. Was thinking of giving Soul Food a try but alas, they are not opened. 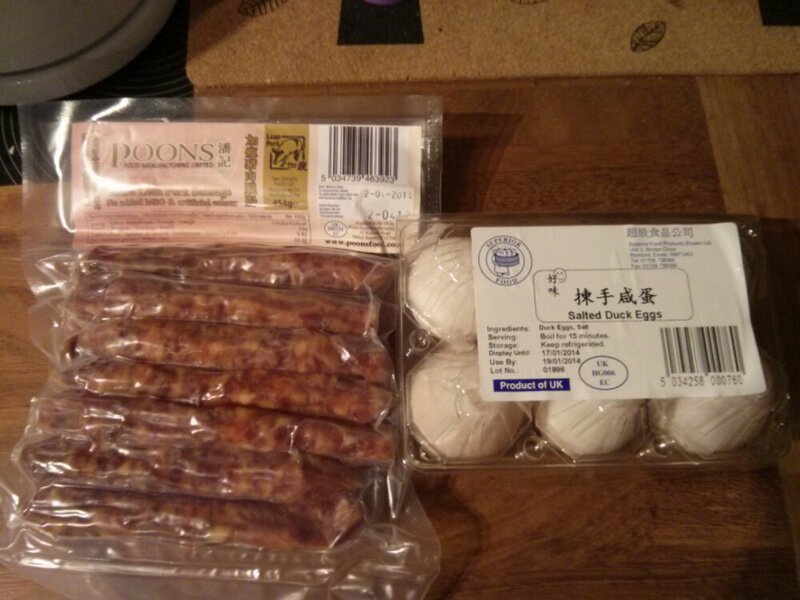 So I went with the stall with the most crowd, Cumbrian Speciality Meats. For Monday to Wednesday, they only have their Pulled Roast Herdwick Lamb wrap so my choice is made. The lamb is roasted, pre pulled and heated up on a electric cooker like the wild rice. 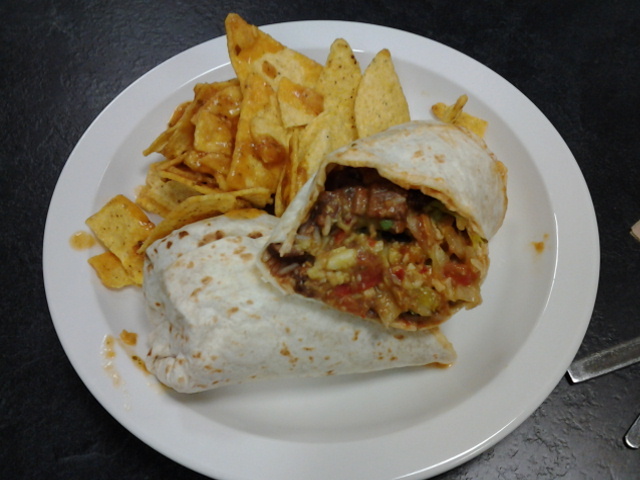 Apart from the lamb, the wrap is served with herb wild rice, a mix salad and 2 sauces. A simple yogurt and cucumber and a slightly spicy yogurt sauce. The wraps are made to order and it’s £5 each. What attracted me to the stall was the whiff of gamey lamb. Some people love it, some don’t. Taste wise, I think it’s ok. I would have loved more lamb and I think the portion of lamb I had was overheated and thus dry. But the gamey lamb taste is still there and mixed with the mild sauce was tasty enough. The wild rice was nicely spiced with coriander while the small portion of salad gave a much needed crunch. I never expected to eat cheap at Borough Market so can’t really complain about the price to size ratio. Let’s just say I can always have soup at the office canteen to bulk up. Sorry for the blurry picture, it’s a cold day afterall. Slowly but surely, I’m wrapping up my tenure in the East End by lunching at places I have yet to try. At the rate I’m going, don’t think I will be able to cover everyone but such is life. 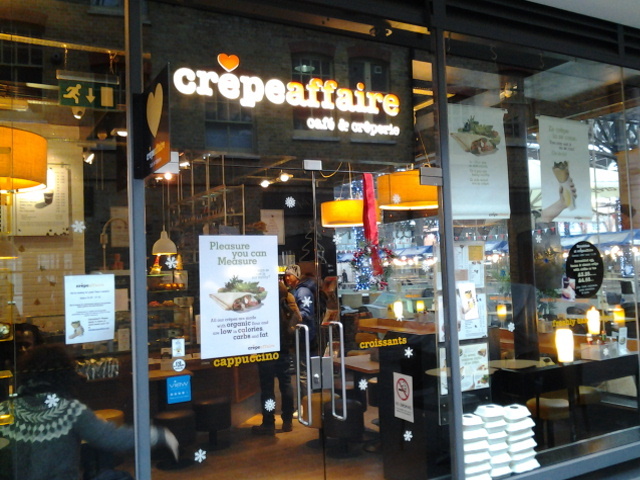 I’m going slightly Continental today with Crepe Affaire, a shop selling both savory and sweet crepe somewhere in the middle of Old Spitalfields Market next to Chop’d. 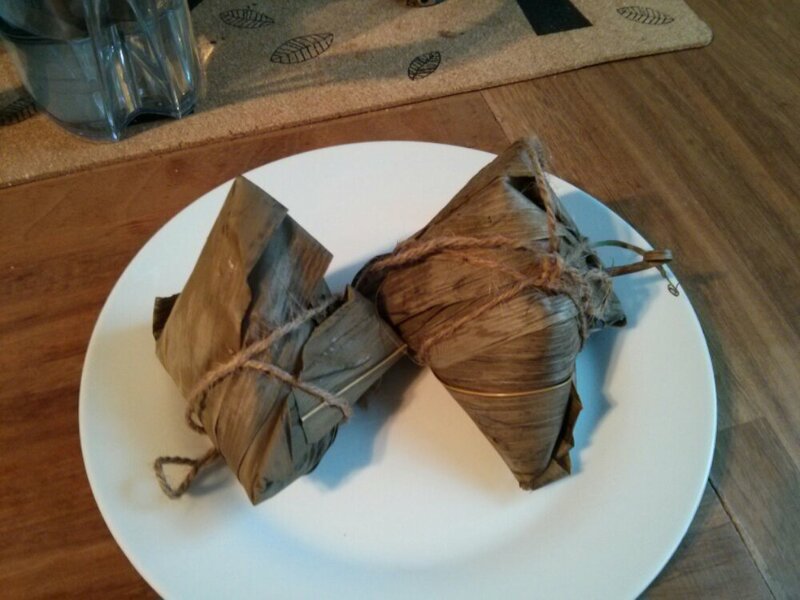 Reason why I have not tried it before is cos I was worried that the portion size might not be adequate for lunch. 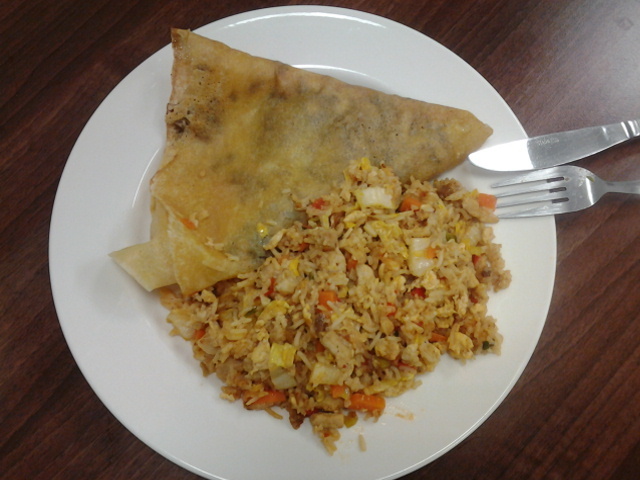 But seeing I have some leftover fried rice from dinner a couple of nights ago, I think a fusion of fried rice and crepe will be adequate for my growling tum. 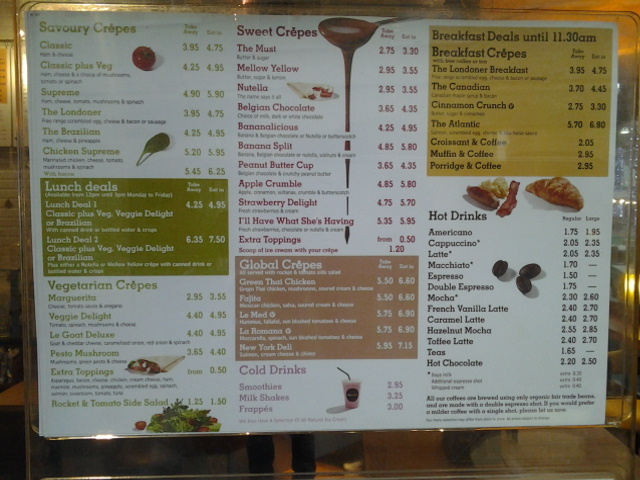 Looking at the menu, both savory and sweet crepes are well presented and there are also a few lunch deals. 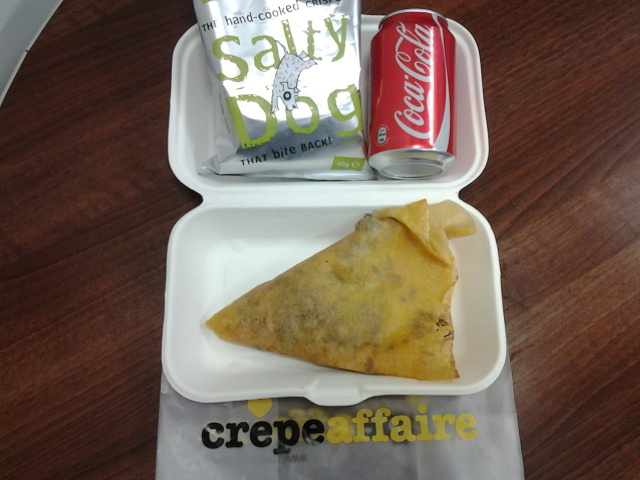 I went with the Classic plus veg with a bag of crisp and a canned drink for £4.25. For this part of town, that’s a pretty good deal. There is a machine in the shop that churns out the crepe skin on site and the crepe with fillings are assembled when ordered guaranteeing freshness. I’m glad I got to try this! The edge of the crepe skin without filling was light and crispy with a strong buttery taste. The combination of cheese, ham and mushroom (this is the plus veg with other choices being spinach or tomato) was rich but not cloyingly. 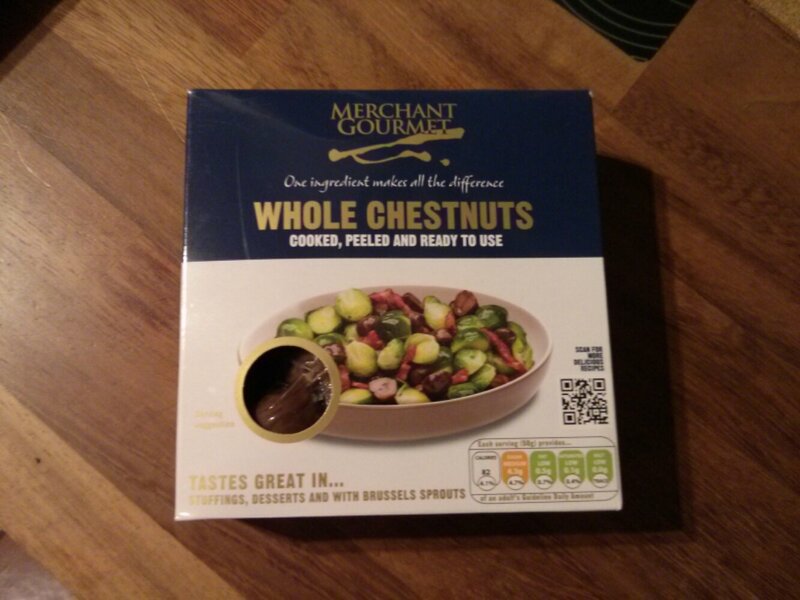 As for portion size, it is a bit small for me but it will definitely make an ample snack. 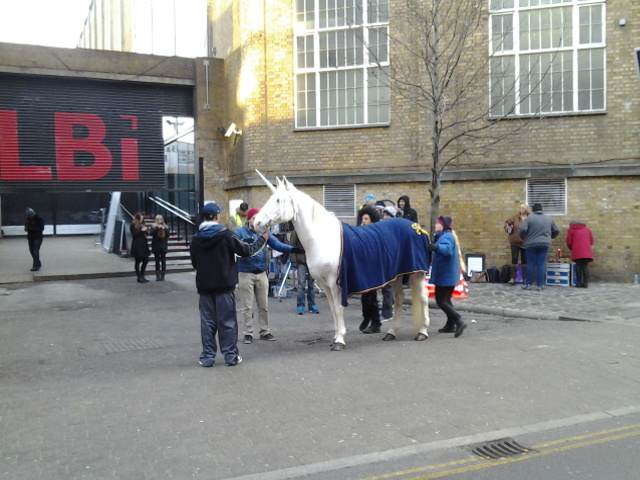 P/S: It must be the magical season, what do I see passing Brick Lane on the way to lunch? Yes! 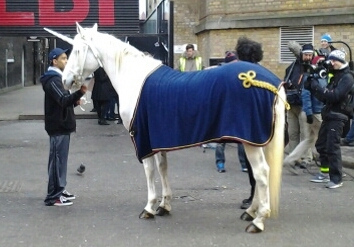 You got that right, it’s an unicorn! Another one of those places I’ve been putting aside which needs to be blogged while I’m still in my current gig. 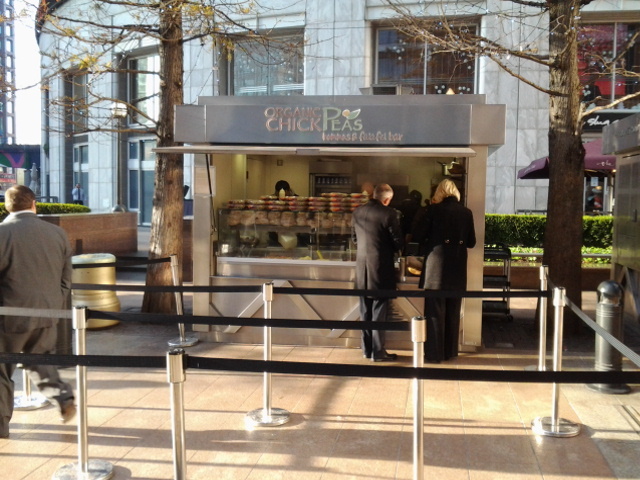 Organic Chickpeas is a falafel stall located with a few other stalls at the Reuters Plaza in Canary Wharf. You will see the stalls on the right when you exit from the Canary Wharf tube station. 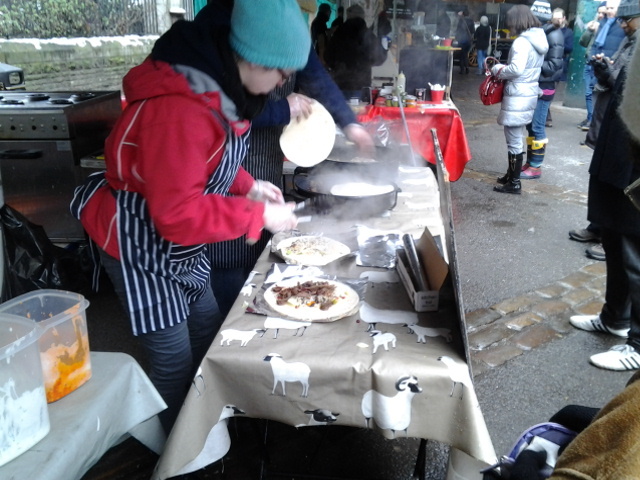 The other stalls sells hot dogs, Indian street food and grill meat with salad. It was really cold today and it took enormous willpower on my part to make the trek from my office block to the stall. Look at how the salad bar got fogged up! 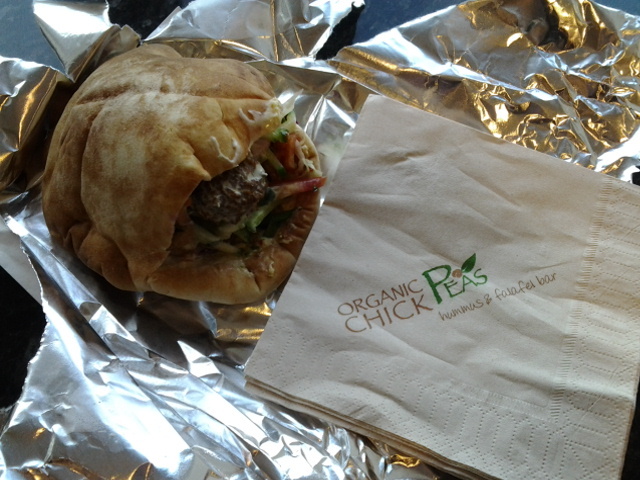 I have had the falafel pita from here before so at least I know my efforts will be worth it. 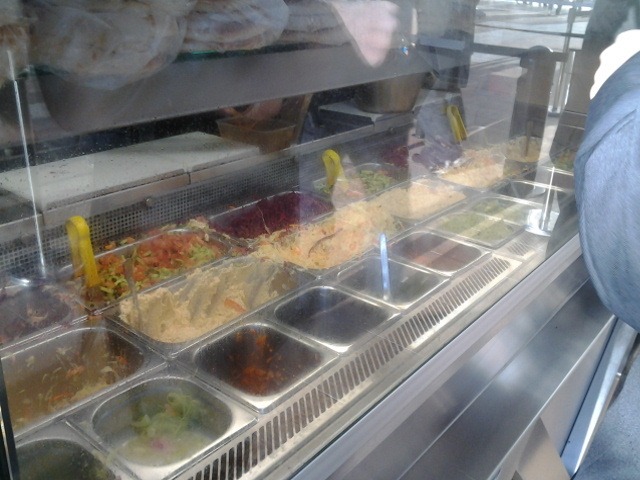 You can chose to have your falafel either as a salad bowl or in a pita bread and you can choose from white or brown pita. If falafel is not your thing, you can just settle for a bigger portion of hummus once again in pita or as a salad. Next you choose from the range of salad available but I just went with everything and got a combination of the chili and garlic sauce. 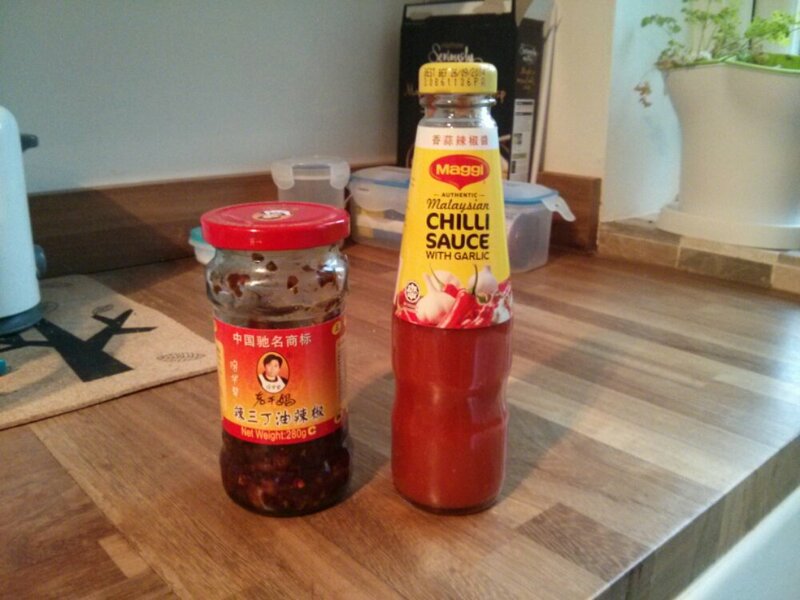 The chili sauce can be quite hot so watch out. 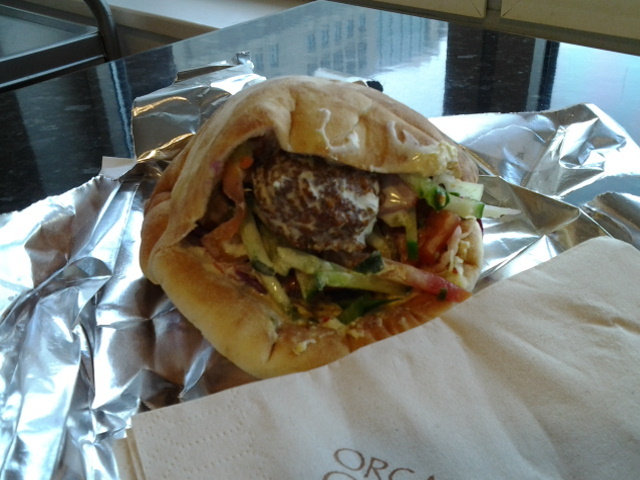 £4.75 for the falafel pita, quite cheap by Canary Wharf standard. In all, I counted about 6 crunchy and warm falafels in the pita bread. Each falafel was as big as a golf ball and were well seasoned and not dry at all. The salad available ranges from cucumber, tomatoes, pickled red cabbage, onions and some others I forgot to note. All very fresh and matches perfectly with the chili and garlic sauce. In all, a very filling but well earned meal. Funny how cravings are like, came noon and my taste buds went ding, I want dosa. 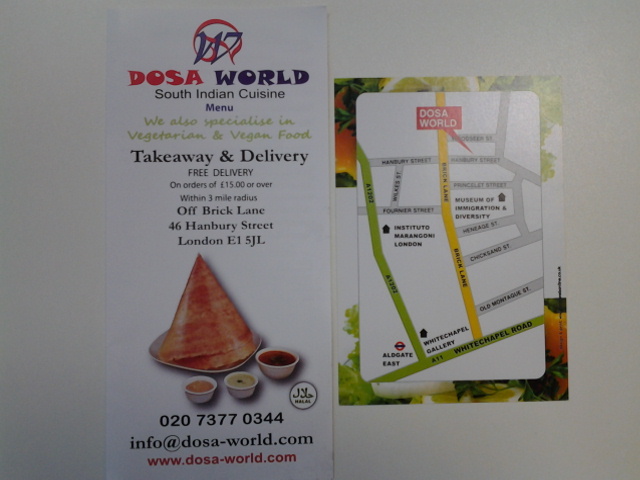 So it’s off to Dosa World for lunch today. I have blogged about Dosa World before and a reader commented that he was surprised I managed to get a Meat Masala Dosa as he thought South Indians are predominantly vegetarians. Found myself standing outside the restaurant staring at the menu to gear myself for a vegetarian meal but the call of protein was too hard to resist. 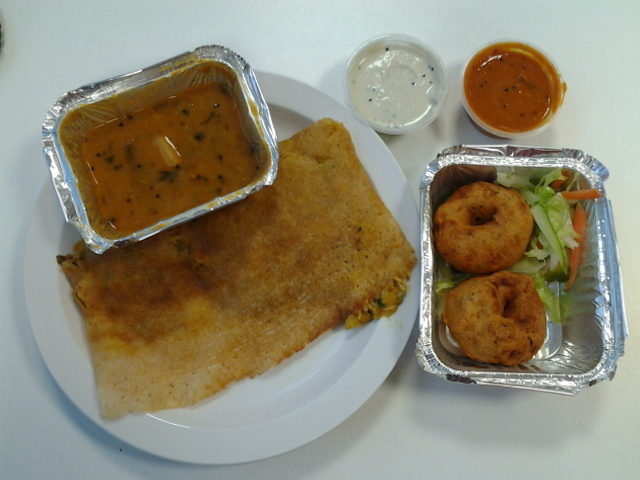 I succumbed and ordered a Chicken Masala Dosa with a side of plain vada. The dosa cost £5.99 while the plain vada was £1.49. 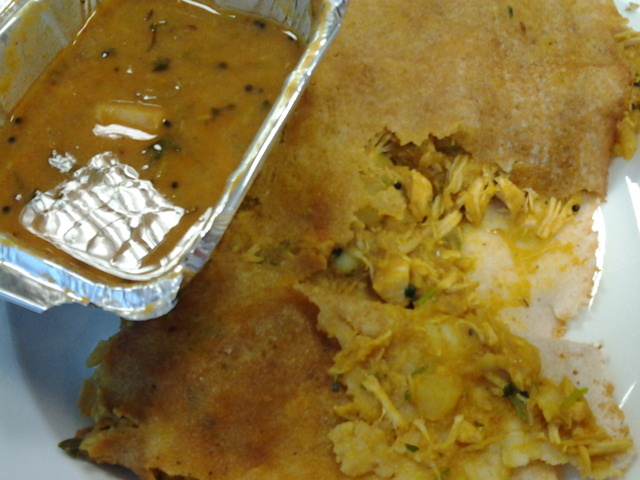 The Chicken Masala Dosa is served with a mild but flavorful sambar. To be honest, I much prefer the chicken to the meat version I have previously. 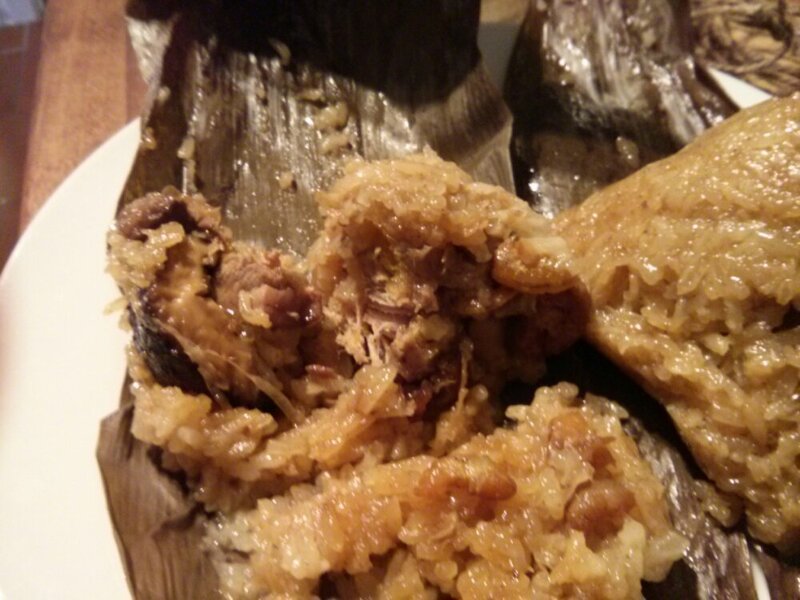 Somehow, it’s more moist and the plain shredded chicken blends in much better with the rest of the filling. 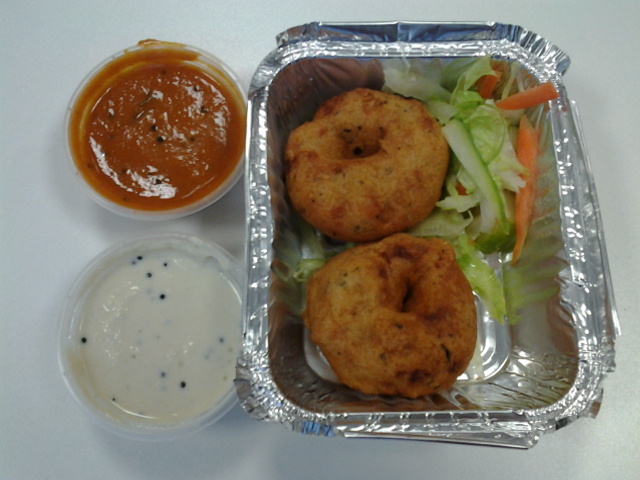 As for the vada, the plain version is so much better than the spinach version! Crunchy on the outside but nice and fluffy on the inside. Perfect with the 2 chutneys that came with the order. The nice man who took my ordered explained that the white chutney is made with coconut (that was my guess before) while the red chutney is more spicy and made with tomato. I don’t know which chutney I prefer, I think they taste best when combined. Brings back memories of when I was a kid growing up in Singapore. The vadas we have usually has a big unshelled prawn on top and always served with fresh whole green chilies. Oh well, the vada from Dosa World will just have to do then. Hola! 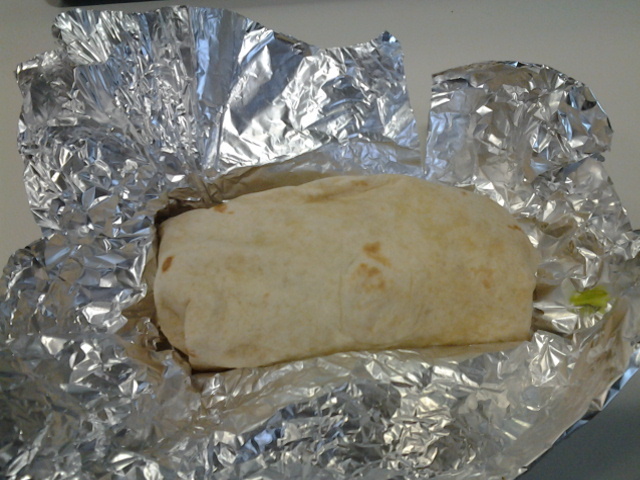 It has been awhile since I had a burrito so thought why not? 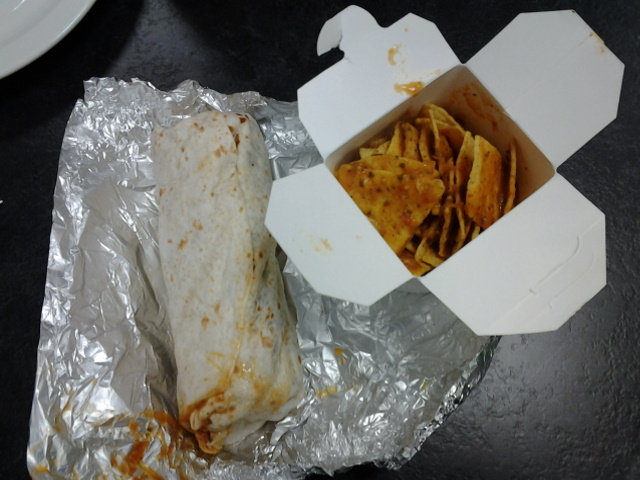 Remembered there was a Mexican place at the Boxpark so I grabbed one while travelling from one office to another. 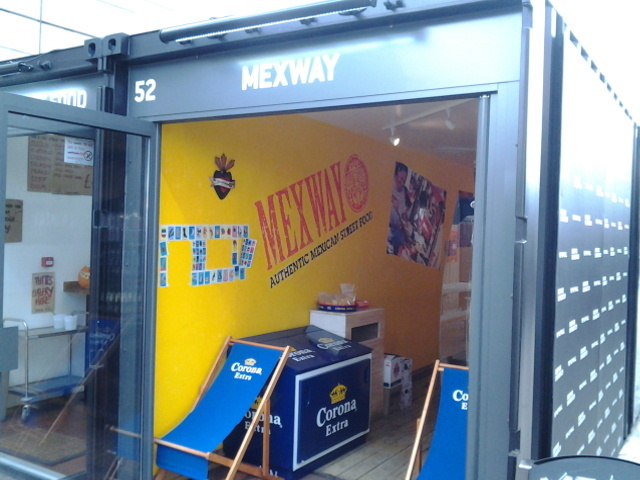 Mexway is one of the few food outlets at Shoreditch Boxpark and I believe this is their only outlet. The container (Boxpark shops are all made out of shipping containers) is mostly taken up by the long counter where the food is assembled so the only seats are outside. Making an order is easy, first you chose between burrito, taco, salad or totopos. What is a totopos you might ask? Reading the definition in Wiki, I think it’s similar to what is commonly known as nachos. Back to ordering, next you chose the filling of either chicken, beef, pork or veggie. Then you choose either rice or beans or both then lastly a salsa. 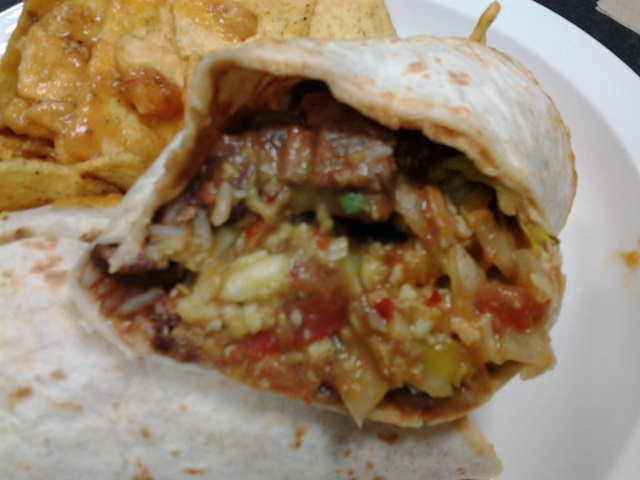 I went with burrito, beef, both rice and beans and the spicy salsa. Apart from that, I also got guacamole, cheese and some lettuce and chopped tomatoes. At £5.95, pricing is pretty standard for a Mexican burrito. Also added some tortilla chips with salsa at £1.50. The burrito is pretty good I have to admit. 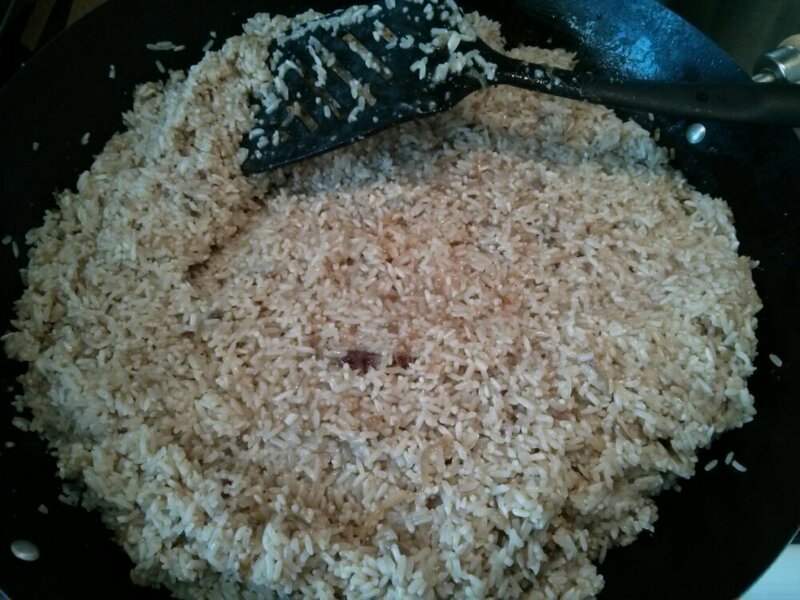 The beef was nicely marinated but still has the beefy taste, the rice was nutty and provides a good chew. The spicy salsa was a killer! Worse was I had the same spicy salsa on my tortilla chips as well. For those you who can’t take the heat, suggest you go with a milder salsa. I can still feel the warmth radiating in my tummy now. 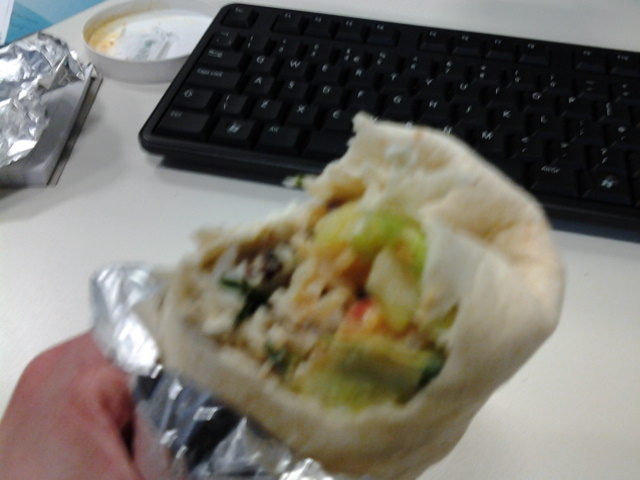 My only complain is that the burrito is not hot (temperature wise). Not asking for it to be boiling but if the meat was kept warmer, I think it would taste even better. Enter your email address to receive notifications of I ate by email.